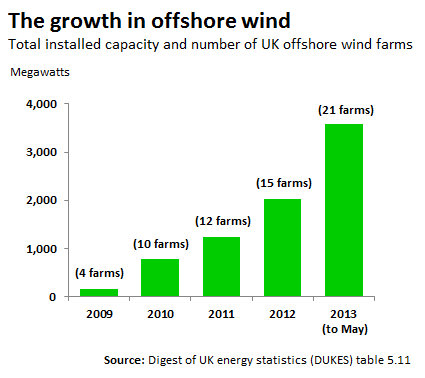 Have the Lib Dems doubled the UK's offshore wind power? The Coalition's green credentials have come under fire in recent weeks as the political furore over rising energy bills has spilled over into the green debate. More recently the Deputy Prime Minister has warned that the winds of change could already be blowing: the green political consensus, according to Mr Clegg, is already under threat. On Facebook, the party turned to their record in government on offshore wind power as a means of shoring up their own green credentials. The DECC figures for electricity generation show the amount of electricity produced by different fuels in Terawatt hours (TWh). For context, one terawatt hour is about the same amount consumed by 300,000 'typical' households in the UK each year. The UK generates about 364 terawatt hours of electricity each year. 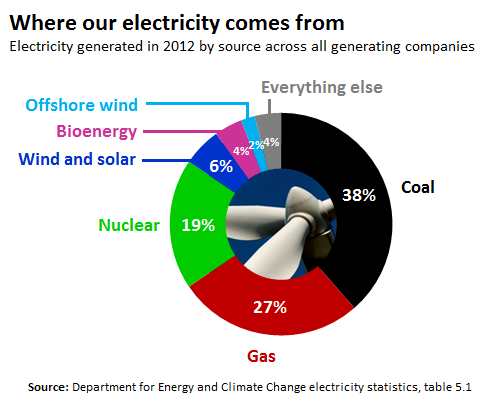 Back in 2010, offshore wind generated 3.04 TWh of electricity of the UK - or 0.8% of all generation. By 2012, it generated 7.46 TWh, just over 2% of the total. Quarterly data is also available, but more volatile. Again, the story is one of growth since the data was first collected in 2010. On this metric, it's fair to say that electricity generation from offshore wind has doubled, and in fact the claim understates the rise both in energy terms and as a proportion of all electricity generated. However, the question over who can claim 'credit' for the rise is less straightforward. Coalition wind or Labour wind? It's worth taking a look at where offshore wind power comes from. At present, there are 22 operational offshore wind farms in the UK (21 are listed by the DECC as of May this year, and Renewables UK list another since). The number has ballooned in recent years: more than half of the total have been operational since 2010. But wind farms, unsuprisingly, don't appear out of thin air. They can take several years of planning and construction to build and become operational. For instance, the Lincs wind farm off the coast of East Anglia (which has an average size compared to other recent developments) became operational in 2012. But it began as a project as far back as 2003 when a lease for the space was granted. Most significantly, the government granted approval for the project in 2008, and construction began in 2010. The Lincs example is a typical one. In fact all the wind farms that have become operational since 2010, as far as we can see, started as projects several years back during Labour's time in office. It's therefore likely that most of the rise in offshore wind generation is actually from wind farms already planned under the previous government, constructed either at the end of Labour's time in office or at the start of the Coalition's stretch. But what about the wind to come? It's a stretch to claim credit for the fruits of long-term projects, but it's only fair to consider what's entered the pipeline since the Coaltion came to power, but isn't yet operational. Renewables UK indentify three significant wind farm projects currently under construction, and seven others which have been given approval. The National Grid also keeps a list of offshore wind farms that are licensed to the national transmission network. This suggests that there are as many as 73 other projects at the early 'scoping' stage, projects which would become effective towards the end of this decade if they materialise. It's more difficult to see in every case when exactly approval was granted, or when projects first came about, but there is at least some suggestion here that the Coalition is overseeing a continuation in the proliferation of farms started towards the end of the last government. As for the claim at hand, however, it doesn't carry a great deal of weight when the realities of wind farm projects are fully understood. How much do 'green taxes' add to energy bills? How competitive is the UK energy market? Do wind farms have a "major economic benefit"? Have energy firm bosses' wages doubled in the last decade?